A promise is a promise. Last week, I said we'd talk about tomato seed varieties today. 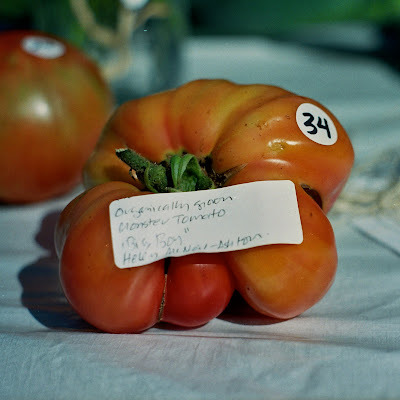 And so without further ado, I bring you Celeste Makely—sole proprietor of Wellfleet's very own Celestial Tomatoes—and her top tomato variety picks for 2010. Last summer was a terrible season for tomatoes. But while I was forlornly yanking up plants and quarantining them in plastic garbage bags, Celeste was taking notes. She wrote down which varieties survived, and which didn't. Because while we all have our fingers crossed for a better year, for something as precious as homegrown tomatoes, it's very much a better safe than sorry sort of thing. On Celeste's safe list are German Red Strawberry, Juliet, Cherokee Purple, Box Car Willie, Amish Paste, Legend, and Red Husky Hybrid. According to Celeste, this is the variety most in demand at the places she sells seedlings to. With Sun Golds, which are very prolific, you only need one plant, which is nice for people with small yards. The fruits are sweet and firm and yellow, and in my experience, are best simply eaten as a snack. We planted not one but three Sun Golds last year, and not only did every one survive the blight, but they all fruited heavily from July through early November. These little red cherries are sweet, and, as the name implies, prolific. Celeste thinks they're an excellent pick for snacking and slicing into salads, and again, if you have a small yard, you only need a few. Celeste likes this Italian heirloom because it tastes good, but also because it's stunningly beautiful. 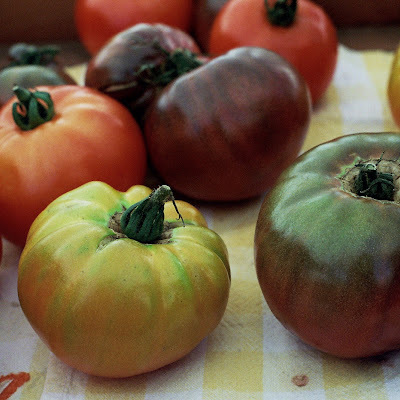 With big, deep ridges and a bright red color, it is the quintessential slicing tomato. Some people think it has too strong of a tomato taste, but Celeste says that's the whole idea. I couldn't decide at first whether or not to include this one. Brandywines have a lot of fans—Celeste and myself included. 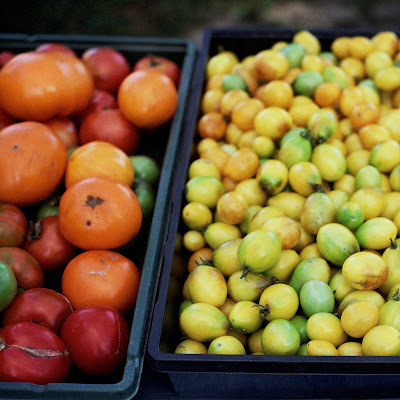 They're one of the tastiest tomatoes you'll ever eat. But they're also slow growing, and kind of finicky, and generally not altogether friendly to the amateur home gardener. Celeste says to think of them as a challenge tomato—maybe plant a few more seeds than you usually would, and be sure to start them early—and they're worth it. Of course, that's if you have space. If you have a very small garden, skip them, but be sure to pick a few up at the farmers' market. Your wallet will be much lighter when you leave, but if you slice one up for lunch and drizzle it with a little bit of balsamic and layer it with basil and mozzarella, you won't mind a bit. Celeste says that if you're going to get just one variety of cooking tomato, it should be this one. It does not come in all at once as it is an in-determinant, but it has a very thick pulp and very few seeds, which makes it an excellent variety for sauces and canning. Thin, juicy tomatoes are excellent for salads and slicing, but for a good, thick, rich sauce, you want the paste tomatoes. San Marzano is at the top of Celeste's list. This is another good sauce tomato, and even better for people who want to put up a lot of crushed tomatoes or tomato juice, because it is a very heavy fruiter and the harvest comes all at once. Romas are the light red-orange variety shaped sort of like an egg that you often see at the grocery store, and there's a reason they got so popular. Celeste sees them as sort of a win-win-win; they're easy to grow, prolific, and they make a delicious sauce. I think that's enough varieties to keep us in tomatoes from July through November, hopefully blight free with pockets filled with sweet snacking cherries and dining tables covered in big, juicy slicers and kitchens steaming up with thick, rich sauce. If you have any varieties to share, let us know—we can always make room for another good tomato. Happy seed ordering, everyone. Great report,I knew about some of these but not others. Also very nice to know what did well in the blight conditions of last year. I was surprised to find San Marzano was a determinate ( may be a typo ? ) I have grown it as indeterminate and wikipedia and a few seed catalogs seem to agree. Some varieties of toms come both ways, but could you double check? Thank you! I do wish you had a spot for plants, but the market is always a good second best. I miss you! I'm so glad. The variety can indeed be confusing, and overwhelming. I hope you have plenty of space this year! I am looking into the San Marzanos. I just emailed Celeste your question, and will be back with an answer ASAP! The Roma, Mi Roma, Saucey, Margarita Hybrid, and a few other paste tomatoes are DETERMINATE as is Legend. San Marzano and Super Marzano are INDETERMINATE. Sorry that I didn't make the distinction clear! I will make the change on the post today. Thank you Russ! Good luck with your crop this year. Well post i have got here thanks a lot for sharing.